Hours after home plate umpire Ron Kulpa ejected Astros coach Alex Cintron and Manager AJ Hinch for arguing a strike one call that MLB's StatCast system deemed an incorrect call, MLBAM's computer quietly changed its call to "correct." Little did we know, Ron Kulpa got it right. What once looked like a pretty significant miss on a pitch low in the strike zone all of a sudden—without any fanfare—was revised to a properly officiated knuckle curve that did in fact nick the bottom of batter Tyler White's strike zone. But by then, the damage was done. The Story: Follow the numbers, if you will: Kulpa's first call during White's at-bat in the top of April 3's second inning against Texas was a strike for Rangers pitcher Mike Minor with a px value of 0.2 and pz value of 1.23 (units of measurement are all in feet). The computer measured batter White's bottom of the strike zone aka the knee hollow as sz_bot 1.51, meaning the radius of the baseball (RAD) took the zone down to 1.387, still greater than the measured pz value (recorded pitch height) of 1.23. Adding in margin of error (MOE), White's zone decreased to 1.304, still more than 1.23, meaning that the expected outcome for this pitch would be "ball." Yet Kulpa called "strike," so the computer ruled it an incorrect call, which fans, media, and the like all ran with—Houston even cited this apparent missed call in postgame comments. 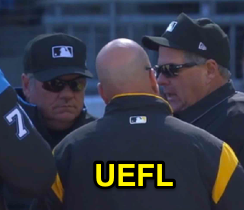 Related Post: MLB Ejections 007-08 - Ron Kulpa (1-2; Cintron, Hinch) (4/3/19). Strike one prior to processing (Brooks). 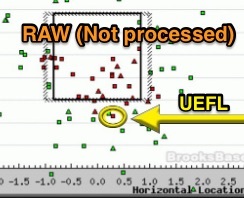 Computer Correction: Postgame processing occurs after MLB's tracker has completed its pitch calling for the day, and before umpires are issued Zone Evaluation scores. Sometimes processing continues through ZE issuance, but in general, ZE is always subject to postgame review whereas real-time TrackMan or MLB Gameday/At Bat app data is raw and unrefined. It was during this postgame processing that the computer reevaluated White's strike zone boundaries and recalibrated the much-discussed strike one call, opting to lower White's sz_bot from a pre-processed value of 1.51 (1.387 with RAD) to a post-processed sz_bot value of 1.34 (1.217 with RAD)—a decrease of 0.17 feet, or 2.04 inches. Strike one after processing (MLB Gameday). Well, baseball is a game of inches, right? It turns out that by lowering the strike zone by 2.04 inches, QOC for Kulpa's strike call changes from incorrect to correct—all without MOE consideration. The processed sz_bot of 1.34 means that the baseball, due to its radius, traversed the strike zone 0.156 inches (0.013 feet) above the zone's revised lower limit. Conclusion: Kulpa's call was correct, the pitch was a strike. Technical Implications: This scenario—the pitch-calling computer changing values such as sz_bot or sz_top (or even px and pz) based on post-game processing—actually happens fairly regularly. We have often written about how the pitch-calling computers are very poor at determining sz_bot and sz_top values. Read our Todd Frazier article, linked below, for further discussion of this problem. 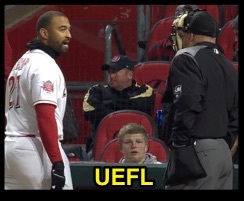 Related Post: Todd Frazier - "These Umpires Have Got to Get Better" (5/3/18). The first deduction here should be obvious: the computer is not always reliable in real-time. The implication of that remark follows similar logic: if the computer is not always reliable in real-time, it cannot be used to reliably call balls and strikes. And finally, we conclude, if the computer cannot be used to reliably call balls and strikes, it should not usurp the home plate umpire in pitch calling. A graphical representation of this can be seen in the following article from 2016. Social Implications: There are two pieces to this story. One concerns Kulpa's interaction with Hinch and the Astros dugout. The situation handling angle is one we discussed in Episode 13M of The Plate Meeting Podcast. 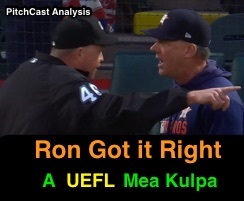 Related Post: Podcast Minisode 13M - AJ Hinch's Mea Ron Kulpa (4/4/19). A sample chyron placed with Kulpa's image. The other concerns the actual Quality of Correctness for the pitch at hand. We now know that pitch was correctly officiated. This not-that-well kept secret also means that the league will rarely, if ever, admit to the flaw's existence. Because the league rarely will ever comment publicly on an umpire's judgment call as it relates to balls and strikes, the league will likewise not issue a statement that its px/pz/sz_bot/sz_top or other similar variables have changed from the end of the game to several hours or days later. Because the league doesn't explicitly comment on umpires' pitch calls, the league has no reason to announce when its computer numbers have changed. In theory, that's pretty fair and pretty logical. In practice, however, the league gratuitously avails its data for public consumption, which is a tremendous service, but one similarly subject to the modern Twitterverse's methodology of "rush to judgment." 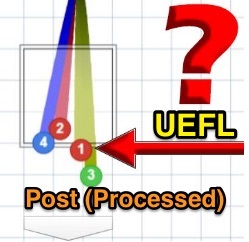 A data scientist (or novice baseball fan) who saw Kulpa's strike call during White's at-bat was exposed to Gameday data suggesting the call was incorrect, and very most likely takes this instant analysis and runs with it—the UEFL itself publishes QOC information in ejection reports based, in part, on this data. A pitch dataset's job is never quite complete. The problem is when the computer corrects its data, such refinement is not announced, leaving a vast majority of consumers to believe that the initial, faulty, data is the law of the land. As for us, we regularly revisit pitch ejection data because we know the computer's post production sometimes causes its numbers to change—that's how we discovered Kulpa actually made the correct call Wednesday night: not because anyone announced it, but because of the old-fashioned journalistic premise of following a story to make sure we get it right. Scoring Change: Ron Kulpa goes from -6 (pre-) to +6 points in the UEFL Standings following this correction (2*[2 MLB + 2 Correct Call], as opposed to -4 Incorrect Call) and Jerry Meals also picks up two points in Crew Division. 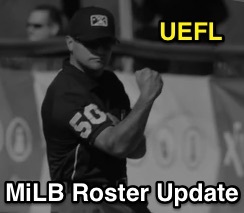 International League umpires take to the field for the 2019 season, and we have the staff roster. The IL is one of two Triple-A leagues, the MLB-feeder equivalent of the west's Pacific Coast League. The 2019 International League features two Triple-A rookies, and zero transfers from the Pacific Coast League. The roster additionally features seven umpires who have been assigned sleeve numbers by Major League Baseball and, thus, are qualified to work MLB games during the regular season as fill-in umpires. *Indicates umpire also regularly officiated MLB Spring Training | ^ Indicates promotion to AAA. Bold text indicates umpire is on the Major League call-up list | -cc indicates Triple-A crew chief. 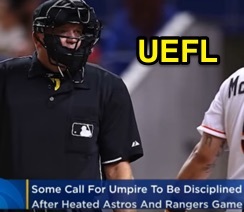 MLB Umpire Ron Kulpa's ejections of Astros Hitting Coach Alex Cintron and Manager AJ Hinch drew the ire of Houston and baseball fans alike, who took offense at situation handling derived from the same impassioned ball/strike argument OBR Rules Committee Chair Sandy Alderson last month said he wanted to see return to the sport. Gil and Tmac discuss a bottom-first Gerrit Cole pitch ruled a ball that appeared in the strike zone, as well as the main event, a first-pitch knuckle-curve from Rangers pitcher Mike Minor to Astros batter Tyler White called "strike one." How did this situation explode and what is an umpire's role in regard to managing a heckling dugout? Is it fair to expect an umpire to ignore bench jockeying, and what happens when this brand of hounding gets to a point where a manager accuses an umpire of giving an opposing team extra calls, possibly due to the actions of an opposing pitcher or catcher? (Hint: It happened in 2018). We also discuss two prior AJ Hinch ejections with shared elements to Wednesday's events and what happens when a manager tries to tell an umpire how to officiate (and vice versa). And is there a lesson in there about how to argue—both on the field and online? Judging by our recent comments section, there quite possibly is a teachable moment here: be nice. 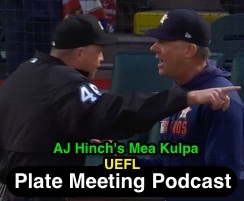 Click the below play (▶) button to listen to "Episode 13M - AJ Hinch's Mea Ron Kulpa" or visit the show online at https://anchor.fm/the-plate-meeting. The Plate Meeting is also available on iTunes (Apple Podcasts), Google, Spotify, Stitcher, TuneIn, and several other podcast apps. Alternate Link: Episode 13M - AJ Hinch's Mea Ron Kulpa. Related Post: MLB Rules Chair Wants to Allow Ball/Strike Arguments (3/29/19). 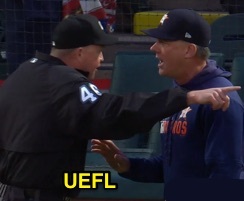 Related Post: MLB Ejection 048 - Tony Randazzo (1; AJ Hinch) (5/27/18). Related Post: MLB Ejection S-1 - Angel Hernandez (1; AJ Hinch) (3/15/19). 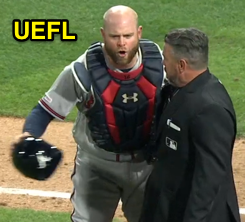 Related Post: MLB Ejection 010 - Tim Timmons (1; Torey Lovullo) (4/8/18). 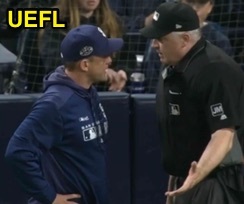 HP Umpire Bill Welke ejected Padres Manager Andy Green (batter-runner's interference call; QOCN) in the bottom of the 6th inning of the Diamondbacks-Padres game. With none out and none on, Padres batter Manny Machado hit a 2-2 fastball from Diamondbacks pitcher Zack Greinke on a fly ball to catcher John Ryan Murphy. Replays indicate that after hitting a fly ball into foul territory around home plate, Machado made incidental contact with Murphy's feet, as in an Armbrister tangle-untangle, and flipped his bat around the D-Backs catcher, but did not appear to interfere with Murphy's ability to make a catch pursuant to Rule 6.01(a)(10), the call was incorrect. * Play was reviewed and affirmed by the UEFL Appeals Board (7-1-1), the call was incorrect. At the time of the ejection, the Diamondbacks were leading, 6-2. The Diamondbacks ultimately won the contest, 8-5. This is Bill Welke (3)'s first ejection of 2019. Bill Welke now has -2 points in the UEFL Standings (0 Prev + 2 MLB - 4 Incorrect Call = -2). Crew Chief Mike Everitt now has 0 points in Crew Division (0 Previous + 0 Incorrect Call = 0). *Rule 6.01(a)(10): "It is interference by a batter or a runner when—He fails to avoid a fielder who is attempting to field a batted ball, or intentionally interferes with a thrown ball...The umpire shall call the runner out in accordance with Rule 5.09(b)(3) (former Rule 7.08(b))." *Rule 5.09(b)(3): "Any runner is out when—He intentionally interferes with a thrown ball; or hinders a fielder attempting to make a play on a batted ball (see Rule 6.01(j))." *Rule 6.01(a)(10) Comment: "When a catcher and batter-runner going to first base have contact when the catcher is fielding the ball, there is generally no violation and nothing should be called." Related Post: Comparison - Infield Interference or Only Obstruction? (7/30/18). This is the sixth ejection of the 2019 MLB regular season. This is the first Manager ejection of 2019. This is San Diego's 1st ejection of 2019, T-1st in the NL West (ARI, SD 1; COL, LAD, SF 0). This is Andy Green's first ejection since September 16, 2018 (Fieldin Culbreth; QOC = Y [Fair/Foul]). This is Bill Welke's first ejection since July 8, 2018 (Tim Leiper; QOC = Y [Pace of Play/Mound Visit]). 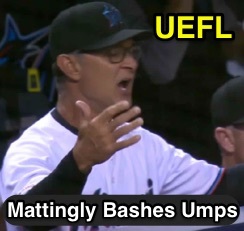 After losing to the New York Mets Monday night, Marlins Manager Don Mattingly tore into HP Umpire Sam Holbrook's crew postgame, complaining that the umpires' calls hurt Miami, citing a check swing bunt-turned-HBP ruling alongside two pitches called balls early in the game as his rationale. Mattingly also called on MLB to review Holbrook's calls, characterizing Holbrook's performance as "shaky." Does Mattingly have a point or is the griping misplaced? Said Donny Baseball, "It was a rough night for those guys. They cost us a run early...I guess I’m not supposed to complain about calls, but the league needs to look at it because it was shaky tonight." Mattingly Criticizes Holbrook's 2nd Inning Calls: Mattingly first took umbrage with two Holbrook ball calls in the top of the second inning, when Caleb Smith threw two sliders to two Mets with two-strike counts: "Sam misses two pitches, Conforto strike three and McNeil strike three, and it cost us probably 15 pitches with [Caleb Smith], and it cost us a run." The first was a 1-2 slider from Marlins starter Caleb Smith to Mets batter Michael Conforto ruled ball two. That pitch was located over the inner half of home plate below Conforto's hollow-of-the-knee. According to the computer value of pz 1.62 for a sz_bot of 1.77, we would have graded the 1-2 to Conforto a correct call had an ejection resulted. Later in the inning, Holbrook balled a 0-2 slider to Jeff McNeil. With a pz value of 1.69 alongside a sz_bot of 1.82, we similarly would have graded the 0-2 to McNeil a correct call. The attached image depicts strike zone boundary error. Wait, that's not what the TV box said. No, it's not. The TV box was wrong. That is to say the pitch tracking computer isn't wrong, but the way in which the broadcast represents the pitch graphically is incorrect. 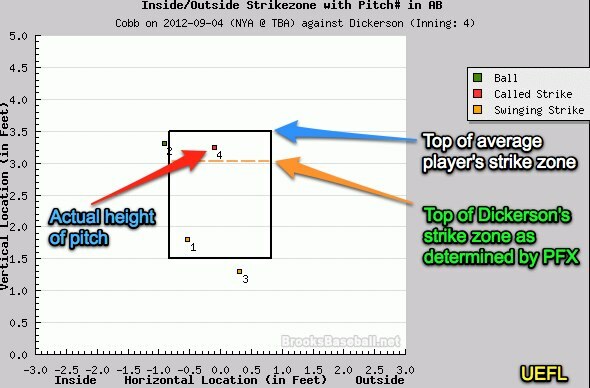 Why did the TV strike zone box "FoxTrax" show the pitches as strikes? This one is simple and goes back to the problem with computer strike zone graphics. In short, we call this conundrum "strike zone boundary error." What is Strike Zone Boundary Error? 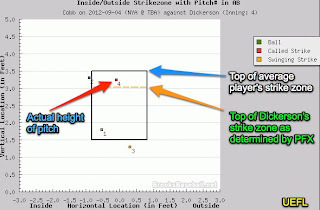 The standard "average" strike zone graphic assumes each batter's sz_bot is 1.50 (with a corresponding sz_top of 3.50). We know that batters are of variable heights and stances, such that each player's strike zone height is different. What might be a sz_bot of 1.50 feet for a 5'5" tall player might instead be a sz_bot of 1.80 feet for a 6'4" player. As we can clearly see, Conforto's sz_bot of 1.77 for his 1-2 pitch and McNeil's sz_bot of 1.82 for his 0-2 pitch are well above the standard 1.50 value, while the two pz values of 1.62 and 1.69, respectively, are in no-man's land—greater than the standard 1.50, but less than the individual sz_bots of 1.77 and 1.82. The Miami broadcast is one of many that opt for a strike zone overlay, that is a box placed on top of home plate that purportedly dictates the strike zone. The problem with overlays is that they are static entities: a true representation overlay would adjust pitch-to-pitch and even during the pitch itself, as the batter changes stance and hollow/midpoint height as the pitch is delivered. Thus, we're left with an overlay using sz_bot/top values that aren't accurate for any one individual pitch, which allows a hypothetical pitch to display in the overlay as a strike, even if this same pitch were to be deemed a "ball" per the computer numbers. Mattingly Criticizes Crew's Non-Bunt HBP Replay Review Call: "That’s a little shaky right there. That’s a shaky call to be honest with you." 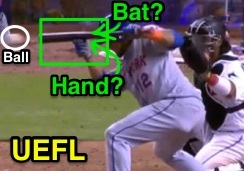 Did the pitch first strike Lagares' hand or bat? In the 9th inning, Mets batter Juan Lagares squared to bunt on a 3-2 count. Marlins pitcher Drew Steckenrider's payoff pitch rode up-and-in and Lagres moved to respond to the pitch sailing toward his head: an act of self-defense as the Marlins TV crew put it. The ball made contact with his hand and/or bat, ruled no swing on appeal by 1B Umpire Dan Iassogna and affirmed via Replay Review as a hit-by-pitch, putting Lagares at first base. Was this a bunt attempt? We analyzed this exact issue in 2018—whether a batter trying to get out of the way of a pitched ball, having previously squared to bunt, has indeed offered at the pitch or if moving the bat back, perhaps even into the path of a cutting ball, is said to be attempting to bunt the ball or not. As we wrote then, the answer is this OBR Definition: "A BUNT is a batted ball not swung at, but intentionally met with the bat and tapped slowly within the infield." 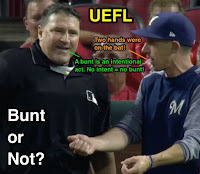 Related Post: Ask UEFL - Foul Bunt or Ball Fouled Away? (8/29/18). 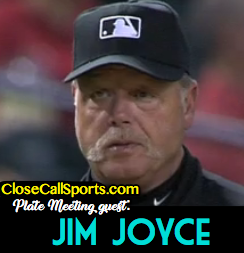 30-year MLB umpire Jim Joyce recently stopped by The Plate Meeting Podcast and discussed this very situation: In 2012, Joyce ejected Brad Mills for arguing a similar play in which a batter pulled away his bunt at the last second in an attempt to avoid being hit by a pitch. The crew ruled the play a foul ball, as opposed to a foul bunt with two strikes. Related Post: Podcast - Episode 12 - The Jim Joyce Jubilee (3/27/19, segment at 1:23:30). This play has happened before. Did Lagares intentionally meet the ball with the bat with the goal of tapping the ball slowly within the infield? If the answer to both parts of that question is "yes," you have a bunt attempt. If either part of that question is "no," it's not a bunt attempt. In my estimation, Lagares was not attempting to tap the ball slowly within the infield—the self-defense act makes this subject to a "foul ball" but not a "foul bunt" call. That said, even before we get to the issue of "foul ball," we have to establish whether the ball first hit the batter's hand or his bat. Even with the benefit of audio and physics, this is a 50/50 call as to whether the ball first made contact with Lagares' knuckle or bat—did it graze the batter's hand before hitting the bat? No matter what the crew called on the field, it would have stood and that's what happened here: HP Umpire Sam Holbrook calls it a hit-by-pitch, appeals to 1B Umpire Dan Iassogna as to the check swing, Iassogna says Lagares did not swing or bunt at the ball, and Holbrook awards Lagares first base. Call stands on review. There's really nothing else anyone could do. Umpires Ramon De Jesus and Ted Barrett enforced a time-based pace of play provision Sunday in San Diego. It was a clock—not for a pitch, but for Replay Review—as the umpire crew denied Giants manager Bruce Bochy the ability to challenge a safe call at Petco Park because Bochy took too long to decide whether he wanted to challenge the play. After San Diego's Manny Machado beat out the backend of a double play attempt in the top of the 7th inning of Sunday's Giants-Padres game, allowing a runner to score instead of the inning to end, San Francisco skipper Bruce Bochy attempted to challenge 1B Umpire Ted Barrett's safe call, only for Barrett to deny Bochy the opportunity after he failed to indicate his desire to challenge in a timely manner. Andy Green is upset over a late challenge. Not to worry, replays indicate 1B Umpire Barrett's safe call was correct and likely would have been confirmed via review. This is a refreshing follow-up to our 2017 analysis on crews' by-and-large tendency, at that time, to allow reviews initiated via Manager's Challenge after more than 30 seconds transpired since the play-to-be-reviewed had concluded. The other part of the rule states that a manager must inform an umpire that he is considering a potential challenge no more than 10 seconds after the play's conclusion (e.g., by the 20-second mark on the clock that is counting down from 30). The analysis indicated that despite the new-for-2017 video replay decision time limit, some crews were still honoring manager requests to review plays well after the 30-second clock's expiration, perhaps loosening enforcement in the rule's inaugural season, while other crew chiefs held tight to the rule and denied requests filed after the clock reached zero. Related Post: Time Limit Trouble - Replay Review from 0-to-30 Seconds (6/8/17). Replay Review Regulation II.D.1.a describes the 10- and 30-second rules: "A Manager must notify an Umpire that the Club is contemplating challenging the play in less than ten (10) seconds after the conclusion of the play. If a Manager wishes to invoke his challenge he must do so within thirty (30) seconds after the conclusion of the play or prior to the commencement of the next play, whichever occurs first. This time limit applies to all plays in the game, including plays that end an inning and plays that end the game." Legendary MLB umpire Jim Joyce stopped by The Plate Meeting Podcast to chat with tmac & Gil about his storied 30-year American and Major League career and quite a few tidbits and accolades from his time in professional baseball during which Jimmy racked up 73 ejections over the course of 3,268 regular season games, three World Series, four League Championship Series, and 10 Division Series. We also discuss the future of umpiring at professional baseball's highest level, robot umpires, pace of play, and look forward to our upcoming podcast with Jim Joyce. Click the below play (▶) button to listen to "Episode 12 - The Jim Joyce Jubilee" or visit the show online at https://anchor.fm/the-plate-meeting. The Plate Meeting is also available on iTunes (Apple Podcasts), Google, Spotify, Stitcher, TuneIn, and several other podcast apps. Alternate Link: Episode 12 - The Jim Joyce Jubilee. Video #1: Jim Joyce calls obstruction to end Game 3 of the 2013 World Series (1:19:00). Related Post: Reviewing Jim Joyce's Game-Ending Obstruction Call (10/13/13). Video #2: Bunt attempt turns into check swing foul ball and Brad Mills ejection (1:23:30). 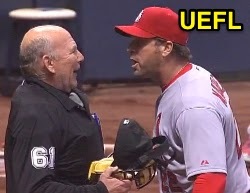 Related Post: Ejection 026: Jim Joyce (1) (5/11/12). Video #3: National media story sample on Jim Joyce & Armando Galarraga Saga (ABC News). Related Post: MLB News: Joyce off Galarraga's Games (6/3/11). Related Post: Unofficial Ejections: Derryl Cousins (1, 2) (6/2/10; The Left Field Corner). Related Post #4: Umpire Jim Joyce Performs CPR, Saves Woman's Life (8/21/12, 1:50:00). Related Post #5: MLB Ejection 153 - Jim Joyce (1; AJ Hinch) (9/8/16, 2:00:00). Related Post #6: Appeals: The Legalese of Reviewable Base Touching (9/20/14, 2:04:45). Related Post #7: Tmac's Teachable Moments - Let's Fix Replay (1/19/17, 2:06:00). Video #8: Lance Barrett ejects Pierzynski and Ventura over a ball call (2:09:30). Related Post: Ejections 138, 139: Lance Barrett (4, 5) (8/25/12). Video #9: Warnings and Intentional HBPs result in a sequence of Kansas ejections (2:12:00). 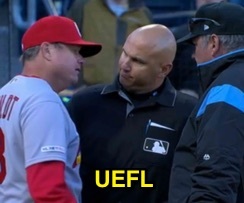 Related Post: MLB Ejections 013-017: Greg Gibson & Jim Joyce (KC) (4/19/15). The Minor League Baseball Umpire Academy, one of two Florida school recognized by affiliated baseball, released a video trailer previewing a new series, "Black and Blue," a look at life at umpire school. The Wendelstedt Umpire School, whose Ormond Beach, FL program is also featured in video form as the subject of a 2016 Great Big Story, is the other institution through which future MiLB and MLB umpires are developed. MiLBUA will debut its Black and Blue: Life at the Umpire Training Academy miniseries April 10. HP Umpire Jeff Nelson ejected Reds LF Matt Kemp (strike three call; QOCY) in the bottom of the 5th inning of the Brewers-Reds game. With two out and one on (R3), Kemp took a 2-2 slider from Brewers pitcher Zach Davies for a called third strike. Replays indicate the pitch was located over the outer half of home plate and at the hollow of the knee (px 0.48, pz 1.53 [sz_bot 1.56 / RAD 1.437, 1.16 inches of overlap]), the call was correct. At the time of the ejection, the Brewers were leading, 3-2. The Brewers ultimately won the contest, 4-3. This is Jeff Nelson (45)'s first ejection of 2019. Jeff Nelson now has 4 points in the UEFL Standings (0 Prev + 2 MLB + 2 Correct Call = 2). Crew Chief Jeff Nelson now has 2 points in Crew Division (1 Previous + 1 Correct Call = 2). This is the fifth ejection of the 2019 MLB regular season. This is the fifth player ejection of 2019. Prior to ejection, Kemp was 0-3 (2 SO) in the contest. This is Cincinnati's 1st ejection of 2019, T-1st in the NL Central (CIN, MIL, STL 1; CHC, PIT 0). This is Matt Kemp's first ejection since June 19, 2018 (Tripp Gibson; QOC = Y [Balls/Strikes]). This is Jeff Nelson's first ejection since July 4, 2018 (Daniel Hudson; QOC = Y [Pitcher Illegal Act]). HP Umpire Vic Carapazza ejected Cardinals 3B Matt Carpenter (check swing strike three call by 3B Umpire Jordan Baker) in the top of the 11th inning of the Cardinals-Pirates game. 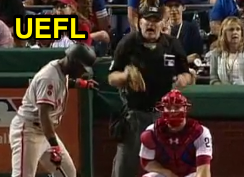 With none out and none on, Carpenter attempted to check his swing on a 2-2 cutter from Pirates pitcher Steven Brault, ruled a ball by HP Umpire Carapazza and a swinging strike on appeal by 3B Umpire Baker. 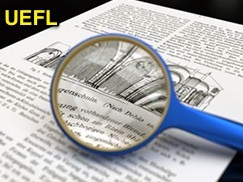 Call was reviewed and affirmed by the UEFL Appeals Board (8-0-1), the call was correct. At the time of the ejection, the game was tied, 5-5. The Cardinals ultimately won the contest, 6-5, in 11 innings. This is Vic Carapazza (19)'s first ejection of 2019. Vic Carapazza now has 2 points in the UEFL Standings (-1 Prev + 2 MLB + 1 Call-Crewmate = 2). *Related Post: Injury Scout - Jerry Layne Exits After Two Head Hits (4/1/19). This is the fourth ejection of the 2019 MLB regular season. This is the fourth player ejection of 2019. Prior to ejection, Carpenter was 0-5 (4 SO) in the contest. This is St. Louis' 1st ejection of 2019, 1st in the NL Central (MIL, STL 1; CHC, CIN, PIT 0). This is Matt Carpenter's first ejection since Sept 25, 2018 (Will Little; QOC = Y [Balls/Strikes]). This is Vic Carapazza's first ejection since September 27, 2018 (Aaron Boone; QOC = U [Throwing At]). Bob Davidson to return to major leagues. 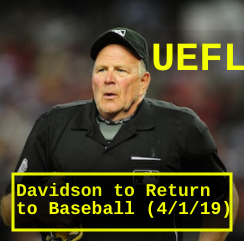 Denver, CO— Closecallsports.com has obtained information that former MLB umpire Bob Davidson will, for the third time, get to call a professional baseball field home when he returns to a Major League field in a full-time capacity as an umpire on Thursday, April 18 in San Diego when the Manny Machado-led Friars host Cincinnati. It will be Machado's first ejection as a member of the Padres. Davidson, an umpire of 3911 MLB games, can’t wait to get back on the field and has been waiting for "the call." "Joe (Torre) told me this was a possibility last year when I happened to run into him at a Colorado Avs hockey game," said the 30-year vet Davidson. "I asked him if there was a chance to get back onto the field. He seemed open to the idea." Torre, the Chief Baseball Officer wasn’t convinced to make the move, however, until consulting with longtime yes-man Peter Woodspork, the Senior Vice President of Baseball Operations. Super Baseball 2020, where everyone's a robot. Baseball hopes Davidson's return will bring the staff below 98% and necessitate robot umpires. 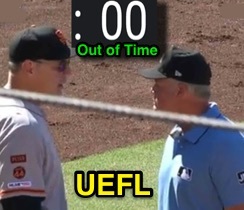 This is also the one-year anniversary of UEFL Ump Show the video game and that seems to work okay. 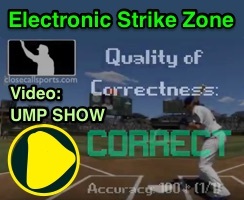 Ump Show also had an electronic strike zone. We had to cut off the interview with Torrey Pines because Director of Major League Umpires, Randy Marsh was in the office lobbying for a World Series. “Every year I have to explain to Randy that he can’t work a World Series just by sitting in my office and begging, but it’s better than when he was on the field and called about once a week,” said the same guy. Alderson, who is now a senior advisor with Oakland and also a longtime friend of the MLB front office, loves the idea of bringing back a spicy veteran. Davidson prepares to eject a fan, "just 'cause." The real impetus behind bringing Davidson back was Woodspork. “Look we live in an anti-bullying environment,” said "Sporky," as he's known to his April 1 friends. “That’s why we don’t do much to help the umpires when they get bullied. Let’s be honest, I don’t have a punching bag anymore. Davidson was easy. He’d throw out a popcorn vendor and I could yell at him. I have nobody to yell at and I feel like not getting angry takes my vitality away. Plus absence makes the heart grow fonder according to Sextus Propertius. That's not part of the fake quote-joke, that's a real name. Look it up. I'm serious, they attribute it to him." "This guy's breath smells like laughing gas." Davidson will take over crew chief duties for Jeff Kellogg who is entangled in a legal dispute with a fan whom he tackled in Baltimore a few years ago. We’ll monitor this story and have more from Davidson as his re-debut gets closer. Until then Happy April 1st everyone. April Fools'. It's all satire and like Whose Line, everything's made up and the points don't matter. CONTACT: Close Call Sports - (507) 400-8335. HP Umpire Rob Drake ejected Braves pitcher Shane Carle (throwing at Phillies batter Rhys Hoskins after a Bryce Harper HR; QOCU) in the bottom of the 7th inning of the Braves-Phillies game. With none out and none on, Harper hit a lead-off home run. Immediately thereafter, Hoskins took a 0-1 fastball from Carle for a hit-by-pitch. Replays indicate the 93.2-mph fastball was located inside and struck Hoskins on the left shoulder, the call was irrecusable. No prior warnings had been issued and Hoskins was the third hit batsman of the game. At the time of the ejection, the Phillies were leading, 4-1. The Phillies ultimately won the contest, 5-1. This is Rob Drake (30)'s first ejection of 2019. Rob Drake now has 2 points in the UEFL Standings (0 Prev + 2 MLB + 0 Irrecusable Call = 2). Crew Chief Mike Winters now has 0 points in Crew Division (-1 Previous + 1 Irrecusable Call = 0). This is the third ejection of the 2019 MLB regular season. This is the third player ejection of 2019. Prior to ejection, Carle's line was 1.0 IP, 2 ER, HR. This is Atlanta's 1st ejection of 2019, 1st in the NL East (ATL 1; MIA, NYM, PHI, WAS 0). This is Shane Carle's first career MLB ejection. This is Rob Drake's first ejection since August 6, 2017 (Josh Reddick; QOC = Y [Balls/Strikes]). 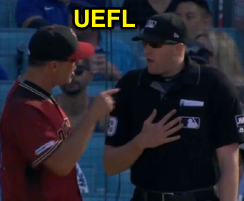 HP Umpire Nic Lentz ejected Diamondbacks LF David Peralta (strike three call; QOCN) in the top of the 9th inning of the Diamondbacks-Dodgers game. With one out and none on, Peralta took a 2-2 cutter from Dodgers pitcher Kenley Jansen for a called third strike. Replays indicate the pitch was located off the outer edge of home plate and thigh-high (px -1.13, pz 2.03 [sz_bot 1.56, sz_top 3.41]), the call was incorrect. * At the time of the ejection, the Dodgers were leading, 8-7. The Dodgers ultimately won the contest, 8-7. This is Nic Lentz (59)'s first ejection of 2019. Nic Lentz now has 0 points in the UEFL Standings (2 Prev + 2 AAA - 4 Incorrect Call = 0). Crew Chief Brian Gorman now has 2 points in Crew Division (2 Previous + 0 Incorrect Call = 2). *This pitch was located 2.592 horizontal inches from being deemed a correct call. This is the second ejection of the 2019 MLB regular season. This is the second player ejection of 2019. Prior to ejection, Peralta was 2-5 (SO) in the contest. This is Arizona's 1st ejection of 2019, 1st in the NL West (ARI 1; COL, LAD, SD, SF 0). This is David Peralta's first ejection since August 27, 2017 (Ron Kulpa; QOC = N [Balls/Strikes]). This is Nic Lentz's first ejection since August 31, 2018 (Aaron Boone; QOC = Y [Balls/Strikes]).